On-farm calf scour testing kits could help farmers quickly identify disease pathogens and design an effective control strategy, which stems around the use of an appropriate disinfectant. Calf scours is a significant issue on UK farms with the 2018 National Youngstock Survey (MSD Animal Health) showing that over three quarters of farmers had seen scours in their calves in the previous 12 months, whilst 48% had lost calves because of the problem. This not only represents a significant cost in terms of mortality and medicine use, but also has far reaching consequences, with calves hit by scours less likely to grow as well and hit target bulling weights. Part of the battle in the fight against scours is understanding exactly what pathogens are causing problems on farm - and that’s where farm test kits can help. Progiene’s Scour Testing Kit can identify rotavirus, coronavirus, E coli, attachment factor F5 (K99) and cryptosporidium in calf faeces within 10 minutes. A much quicker diagnosis compared to several days via laboratory analysis, which enables the correct treatment strategy to be implemented rapidly; in-line with vet recommendations. Alison Clark, Business Unit Manager for Progiene, (the farm hygiene division of Rumenco), says understanding scour pathogens also arms farmers with information to select the best possible disinfectant. “A “one size fits all” strategy does not work with shed disinfectants as not all of them will be equally effective against all pathogens,” she explains. 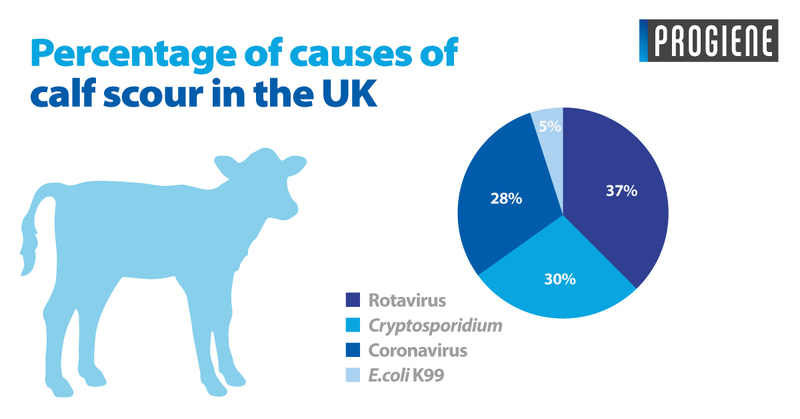 “That’s why it’s so important to understand what disease challenges you have on farm.”Cryptosporidium is the main cause of scours (see graph). However, because this is caused by a protozoa, a specific disinfectant is needed to penetrate the shell of the eggs, which live in the environment. If the right product is not used, calves will continue to ingest the eggs and the infection cycle will continue. • Be aware that “Defra Approval” does not mean that a product is effective against cryptosporidium. • “Defra Approval” can cover one or several of the following: Bovine TB, Foot & Mouth Disease, Swine Vesicular Disease, Poultry Orders (PO) and General Orders (GO), such as E-coli and Salmonella. • Use at the correct dilution rate for the appropriate disease - Dilution rates vary for specific diseases so check the product label and adhere to guidance for whichever disease you have on farm. When using against more than one disease, use at the strongest disease dilution rate. • To be effective against cryptosporidium and coccidiosis, a product must say it has been “Efficacy tested for cryptosporidium and coccidiosis” or at least have ammonia or chlorocresol as the active ingredients. • Coxicur is a broad spectrum, Defra Approved disinfectant for TB, PO and GO and also effective against cryptosporidium and coccidiosis. To help in the prevention of disease spread, disinfectants can also be used as an effective boot dip. Alison reminds farmers that when using disinfectants in this way, they should also be effective against specific disease challenges on farm. “I often see products used on the entrance and exit from farms that are not effective against TB when that is largely what the farmer is trying to control,” she says. Alison also urges farmers to ensure a proven housing disinfectant is used as part of an effective overall cleaning strategy. 1. Clear out as much muck and organic matter as possible first - disinfectant will not be effective if it is not able to reach the surface. 2. Pressure wash debris off the walls and stanchions. 3. Apply a foam detergent through a pressure washer or S105 Foaming Unit - an alkali foam detergent with a long “cling factor” is preferable as they will cling to the surface for longer and break down organic matter. For example, Incicrop Extra will stay on the surface for up to one hour. 4. Rinse off the detergent with a pressure washer. 5. Apply disinfectant - use according to the manufacturer’s instructions. 6. Leave for a minimum of four hours and allow the building to dry before restocking. 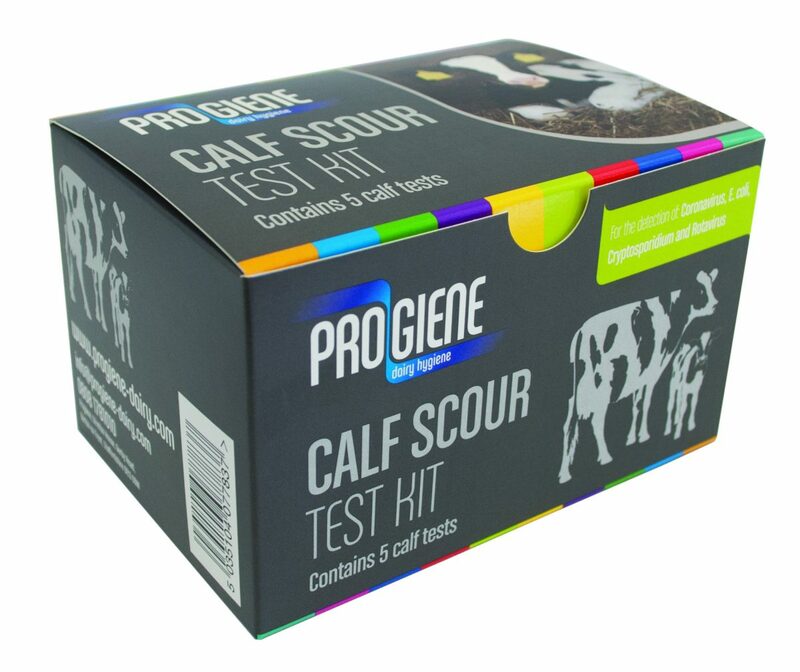 How do I use the Progiene Calf Scour Test Kit? A faeces sample is put in a tube of test liquid. Some of the solution is then dropped onto a test cartridge with the appearance of a coloured line suggesting infections with each of the pathogens tested. Rotavirus, coronavirus, E coli, attachment factor F5 (K99) and cryptosporidium. £15 for one animal for all four diseases, versus up to £50 a test via the lab. 0808 178 1010 or contact us here for more information on their range of disinfectants and calf scour test kit.